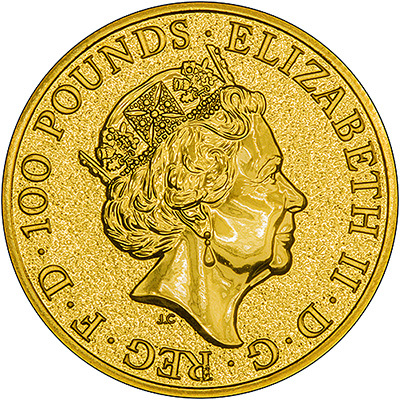 This one ounce gold bullion coin was issued by the UK's Royal Mint and is part of the Queen's Beasts bullion range. We received our first delivery on 8th December, 2016. 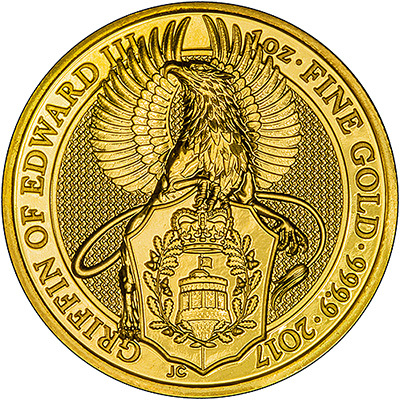 This griffin is the second in the Queen's Beasts bullion series. There will be ten coins in the series, each one featuring one of the Queen's Beasts on the reverse. The first coin, issued in 2016, featured a lion. As UK legal tender, these coins are exempt from CGT. The obverse features the fifth coinage portrait of Queen Elizabeth II, by Royal Mint engraver, Jody Clark. The reverse was also designed by Jody Clark, and features a griffin, on top of a shield. The text reads "GRIFFIN OF EDWARD III. 1OZ. FINE GOLD. 999.9. 2017"
The coins are issued in 0.999 fine gold and are available in 1oz sizes.